Our featured artist for the month of April is Lynsea Montanari, Narragansett. A former educator at the Tomaquag Museum, Lynsea has continued to grow as an artist exhibiting in numerous shows throughout Rhode Island. With a passion for sharing Indigenous culture, Lynsea will be speaking about breaking down stereotypes through art. 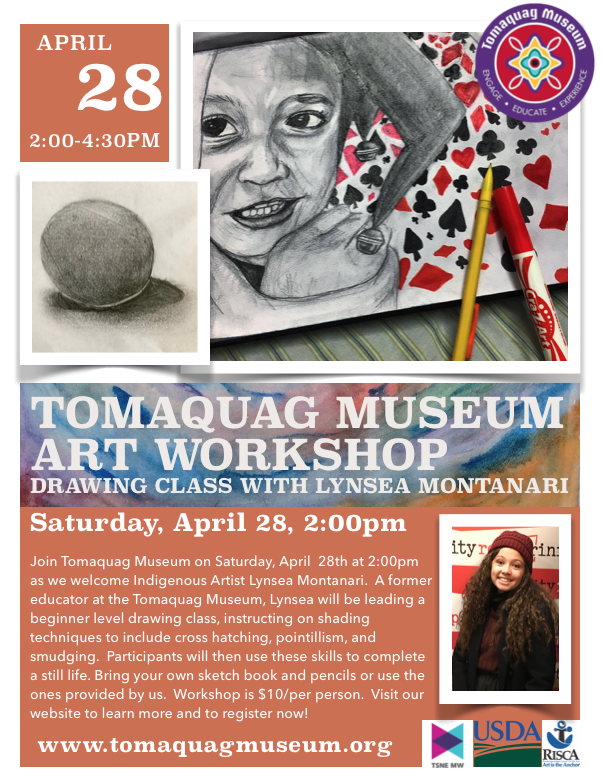 Join Tomaquag Museum on Saturday, April 28th at 2:00pm for a beginner level drawing class, with instruction on shading techniques to include cross-hatching, pointillism, and smudging. Participants will then use these skills to complete a still life. Bring your own sketchbook and pencils or use the ones provided by us. Workshop is $10/per person. Visit the link below to register online or call us at 401-491-9063. Any questions? Email slarose@tomaquagmuseum.org.